Ancient remains uncovered in Ukraine represent some of the oldest evidence of modern people in Europe, experts have claimed. Archaeologists found human bones and teeth, tools, ivory ornaments and animal remains at the Buran-Kaya cave site. 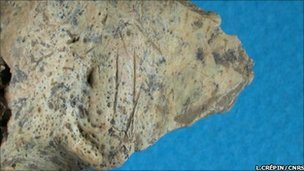 The 32,000-year-old fossils bear cut marks suggesting they were defleshed as part of a post-mortem ritual. Details have been published in the journal PLoS One. Archaeologist Dr Alexander Yanevich from the National Ukrainian Academy of Science in Kiev discovered the four Buran-Kaya caves in the Crimean mountains in 1991. Since then, roughly two hundred human bone fragments have been unearthed at the site. 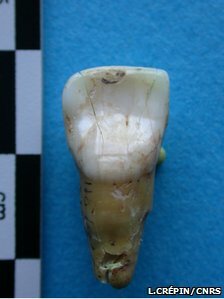 Among the shards of human bones and teeth, archaeologists have found ornaments fashioned from ivory, along with the abundant remains of animals. The artefacts made by humans at the site allowed archaeologists to tie the ancient people to a cultural tradition known as the Gravettian. This culture came to span the entire European continent and is named after the site of La Gravette in France, where this stone age culture was first studied. One thing that intrigued researchers was the scarcity of human long bones (bones from the limbs) in the caves. The site yielded countless limb bones from antelope, foxes and hares. But the human remains consisted of vertebrae, teeth and skull bones no larger than 12cm. What is more, the positions of cut marks found on the human fragments were distinct from those found on the animal bones. And while the bone marrow had been removed from butchered animals, it had been left alone in the case of the human remains at the site, explained co-author Sandrine Prat from the French National Centre for Scientific Research (CNRS) in Paris. She suspects this demonstrates that human bones were processed differently from those of animals. Human flesh was removed as part of ritual "cleaning", not to be eaten. The finds offer anthropologists a glimpse into a very early and important human culture, said Professor Clive Finlayson, an evolutionary ecologist and director of the Gibraltar Museum. "Gravettian culture is the culture that defines modern humans." "These people had knives, lightweight tools, open air camps, they used mammoth bones to make tents," he said, adding that this was the earliest example of the Gravettian cultural tradition. Professor Finlayson said that uncovering evidence of this culture in Ukraine gave weight to the idea that early modern people spread into Europe from the Russian plains, not north through the Balkans from the Middle East. "What has excited me is that we have found evidence of humans where I would expect them to be, exploiting foods that I would expect them to be exploiting," Professor Finlayson told BBC News.